In recent years a phenomenon called “frugal innovation” has increasingly gained traction in the scholarly discourse; and as research reveals, it is often brought in connection with India. Apparently, India has quietly acquired the role of a pioneer for innovations that aim at combining affordability with excellence, cutting across sectoral boundaries. But what is it that makes India a forerunner for an innovation paradigm with increasing global relevance? 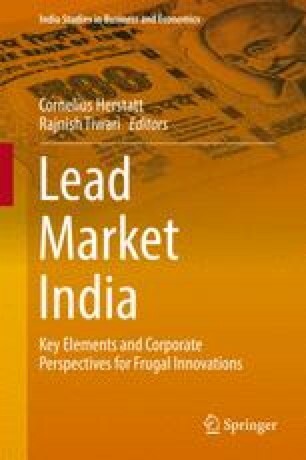 In this paper, I propose that the “lead market” theory can explain to a quite good extent the attractiveness of India for frugal solutions. On one hand, there are concrete economic factors that give rise to resource-efficient and affordable solutions to problems faced in day-to-day life. On the other hand, frugality has been long regarded as a virtuous social value in India and the socio-cultural context of the country provides a fertile environment for the acceptance of frugal products and services on both demand and supply sides. This paper, apart from dwelling on the concept of lead markets and its application in the context of frugal innovations in India, also presents some qualitative results of an empirical survey conducted by the author with participation of Indian students that underscore the role of culture as a key determinant for the acceptance of frugal innovation by relevant stakeholders. The author would like to sincerely thank Claussen Simon Foundation for supporting his research at TUHH with a generous grant.